Moragot's Art: A Christmas Carol - In Space! A Christmas Carol - In Space! Here's the first part of my next project. I did this sketch a while back, and today I decided to revisit it. This was not the original sketch because I wanted to alter it a big. I was totally satisfied with the original design. 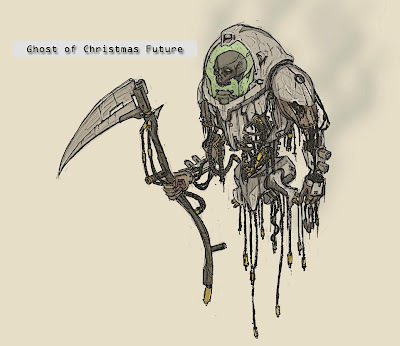 The theme when I originally drew it was "Futuristic Ghost of Christmas Future". So after seeing the sketch again, I was inspired to do the others as well. 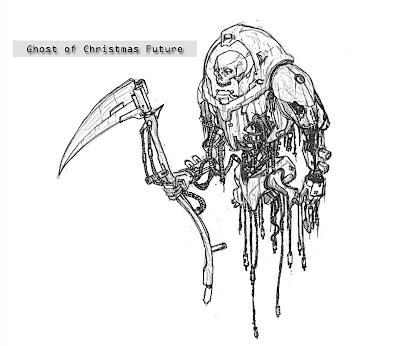 So in the following days, expect to see the space version of the Ghost of Christmas Present and Past, as well as Scrooge. I was heavily influenced by such movies like Event Horizon and Alien. I wanted it to be very fitting for the "space-horror" genre.